but rather a resource for experienced electronics hobbyists. The 5E3 tone control is a low-pass filter and (as designed) reduces so large a portion of the mid-high audio spectrum that more than just a bit of counter-clockwise rotation results in a significant loss of gain - enough so that any overdrive is lost while everything other than the bass frequencies remain. Personally, I think the cutoff starts way too far down the spectrum and as such the control is not as useful as it could be - especially where overdrive is concerned. Interestingly, I had built a circuit with the same control some time ago, and the sweeps of the filter show a shelving of the high frequencies after an initial slope from the cutoff point. The problem here being that if the highs are shelved from too low a point, then the tone control doesn't really help to reduce the edge these amps are known for when cranked up - all that happens is all the highs are cut equally so that the edge is always present, unless enough rotation is used at which point the tone turns muddy and the gain is gone. While recording some tests of the amp in overdrive recently, I spent quite a bit of time trying to dial out the edge as usual (which always plagued my amps and was something that I could never completely solve) via mic placement and Pultec EQ, and thought to myself if the tone control would just cut the highs from a higher starting point, then it might be possible to reduce or even eliminate the edge, while retaining most of the rest of the signal to preserve gain. Well, I'm happy to report that I tried it and it worked. To be fair, my Tweed amps sound great in a room, but I always turn them away from me and towards a wall so as to mitigate the edge; but when close-miking it was always very difficult to get an acceptable sound for solos (although in some cases solos and rhythm tone actually do well with some edge). In any event, I can now turn the amp to face me - and the edge is still there if I need it. 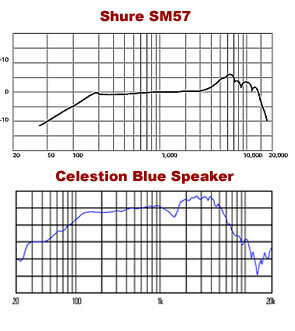 Thinking about it, speakers emphasize the mid-highs, and so do many microphones used for recording amplifiers; and engineers are nearly always pointing microphones away from the center of the cone, and cutting highs - all this top-end response, only to be ultimately avoided - it just made sense to make the tone control more effective. Now, what happens is that the amp's tone is the same as before but the edge can be dialed out while the gain and mids are still there because the cutoff frequency starts much higher. The tone control is now useful at settings below 8 and the change has created a new range of smooth, early overdrive crunch that the amp didn't have before because the tone was too shrill. (Strat bridge pickups sound especially good.) My Tweeds always had a little harshness at early breakup and that is now gone. As before, however, the effect of the tone control is diminished as the volume (bright channel) is increased, but now there is more gain at moderate-high settings - even with the tone control full-off - meaning that going from volume 10 to 12 is not going to add anything but sag and edge. So there you have it. 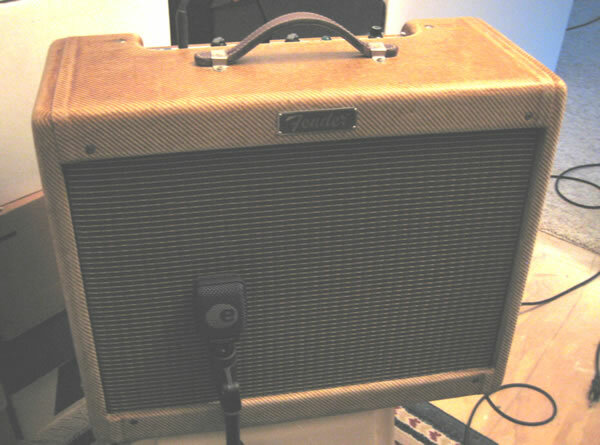 Thinking about it now, I suppose the tone circuit - as designed - is the single biggest contributor to Fender’s Tweed era sound; and while it’s nice to have that original edge, it’s much better to be able to dial it down, if desired. 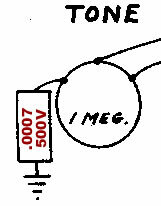 What’s nice also is that it’s not really a modification of the circuit, just a change in a cap value – a value to which an old capacitor in an old amp might have drifted, and with said change the tone circuit (although, of course, still a low-pass filter) is perhaps better envisioned as a high-cut control. 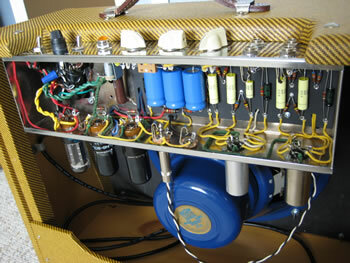 This mod is now standard with my Studio-Series Deluxe amplifiers, please visit tweeddeluxe.com for more info. I've been a bit busy lately, but have just had the chance to spend about 2 hours playing the amp and have to say, it's just great. With either my Strat or 335 there are now many more tone colors available, all due to the ability to roll-off some of the highs. Now, varying degrees of tight crunchy rhythm (think Mary Jane's Last Dance, In the City or Life In The Fast Lane) tone is available without any hint of harshness, as well as a nice midrange-centric, round, solo tone (Felder and Walsh in Hotel California) that goes from clean to Gibbons' Cheap Sunglasses or Leslie West's mountainous early overdrive (a Les Paul Jr. would sound fantastic) all while retaining the original character of the amp. I played today primarily with the channels jumpered and plugged into the high-gain, bright input; and by changing both volumes and the tone control - with either humbuckers or single coil pickups - I was able to get some really inspiring sounds on both bridge and neck pickups. No effects, straight-in, and it's just so much better. I suppose that rolling off the highs results in a more Marshall-like, 'tight' tone, otherwise the original tweed character is still available. Although I have not yet recorded the amp with this modification to the tone control, I'm confident that it will be much easier to get some great sounds and really look forward to its enhanced flexibility. The Tweed is a rocking amp, but it's really hard to capture that Marshall sounding overdrive with a microphone on the speaker. 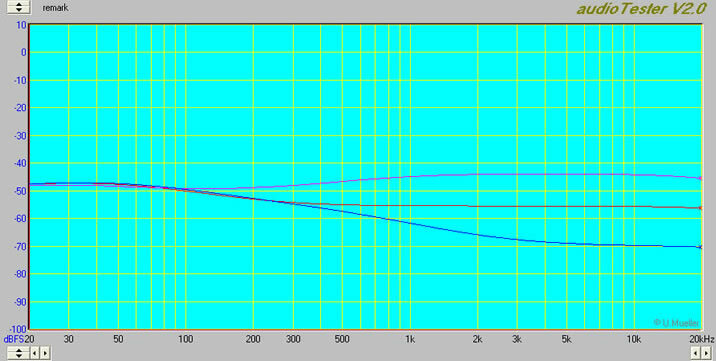 To the right you can see that an SM57 boosts frequencies above 3k all the way up to and beyond 10k, couple that with the average guitar speaker frequency response (here the Celestion Alnico Blue), an overdriven amp and digital recording and you have the makings of fizzy, edgy guitar solos. I spent a couple of hours today working with microphone placement and outboard EQ, eventually recording a brief clip (without any EQ) that pretty faithfully captures the sound of the Tweed Deluxe cranked up. Test clip signal chain: 1968 Gibson 335 (settings: bridge pickup, volume and tone on 10) into my old Tweed Deluxe with a re-coned 1960 Jensen P12Q speaker and low-pass mod (settings: bright channel high-gain input, volume 10, tone off, unused channel off). The microphone is a Shure SM-57 about 6 inches in front of the amp, the capsule midway between the dust cap and edge of the cone, pointing 90 degrees (perpendicular) away from the dust cap (I still had some edge to deal with and this position provided a signal that is closer to what the amp really sounds like live in a room). Preamp is just my DIY La2a, without using any compression. My DIY Pultec is in the circuit but not active. There are no effects or other signal processing, it's just a dry signal, single recorded track, center-panned. I Listened to some Eagles music last night and Felder's guitar tone is really smooth without a trace of fizziness or harshness. I played along for a while and was really surprised to see how much high-end has to be rolled off to achieve that kind of smoothness (I was not going for that sound on this test clip, as achieving that would probably require outboard EQ to trim more highs). Interestingly, reducing the highs that much also cleans up the recorded signal quite a bit which helps explain why Felder's lead guitar work always sounds rather clean but still sustains well. As a side note: Felder and Walsh almost always run some effects on their solos - phasers, flangers, echo, reverb, fuzz faces, etc., so it's hard to determine what is really going on with the signal chain as inline effects can really alter the frequency response of the amp. Larry Carlton on the other hand, supposedly ran straight into his Deluxe with no effects whatsoever on Royal Scam, his tone on which was the major reason I built my Deluxes. Hence my surprise and great disappointment when I first tried to record with mine and it didn't sound like that - I'm now realizing that it's really just a matter of microphone placement and possibly some outboard EQ. Back to the mod; it would appear to make sense that beginning with a frequency response that exhibits less highs would be a much better starting point from which to work; allowing, for instance, microphone placement nearer the dust cap if desired, to facilitate a raw signal that represents a more even frequency spectrum. 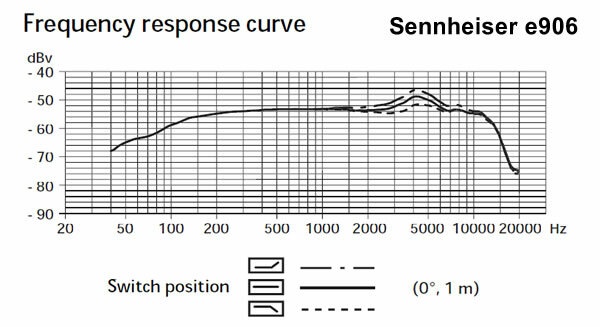 Therefore, without the low-pass mod, I would had to have placed the microphone farther out on the cone of the speaker, and may even needed some outboard EQ to achieve the same response present in the clip - at which point the tonal characteristics would be different. Generally, clean tracks and rhythm work can benefit with more high-end response, but for overdriven soloing - at least for me - the amp's edge has to be dialed back drastically in order to approach a smoother tone that still cuts but doesn't sound harsh. Note: It is my experience that encoding mp3s at anything less than 192kbps can result in an artificial boost of some higher frequencies. In any event, depending on your sensibilities, the clip may not sound like much, but for me it's a milestone as I've been trying unsuccessfully to capture the true sound of the cranked amp for quite a long time, and this is pretty close (there's still a bit of 5k edge present - probably due to the SM57 - that I might otherwise dial out for tracking solos). So although it's possible to get similar response with microphone placement and outboard equalization, I still think the low-pass mod is worth keeping as it opens up a range of new sounds for the amp, helps knock out the highs while preserving gain, and presents a better starting point for recording overdriven solos - all while retaining the original character and sounds of the amp. Signal chain: Gibson 335 (bridge pickup, volume and tone on 10) Tweed Deluxe (low-pass mod) with tone off and volume about 8.5. The Sennheiser is placed touching the grill cloth and pointing at the cone of the '60 P12Q midway between the dust cap and edge; the highs are rolled off at the microphone. The La2a is acting as preamp again, also compressing (less than -1 dB), and the Pultec is in and cutting 20hz (10 o'clock), boosting 3k (12 o'clock) sharp, and cutting 20k (12 o'clock). The Pultec settings helped roll-off some of the increased bass response of the e906 (vs. the 57) as well as shift its somewhat flat response more mid-centric. Again, what I'm going for in the clip is a nice midrange curve, 70's California type tone, and I play a bit of the Eagles' King Of Hollywood and Linda Ronstadt's You're No Good solos (along with a little I Don't Need No Doctor from Humble Pie for good measure). I just received the microphone today and like it a lot; it's definitely warmer than a 57 (especially with the high cut) and it's smoother - just what I was looking for when recording overdriven solos with the Deluxe. In my opinion, the e906 offers a pretty flat sounding response without any peak frequencies in the higher range, and more faithfully captures the sound of the amp in the room, which is a nice way to start the signal chain while recording overdriven amplifiers.